Bebe Rexha attended the Nickelodeon’s Kids’ Choice Awards wearing Whyte Studio The Prix Blazer Dress (£300.00), Zara pants similar to these ($29.90), Diagonal Stripe Ring ($295.00) and Stripe Signet Ring ($225.00) both by Jennifer Fisher, Le Souk Ring ($87.00) and earrings similar to these ($125.00) both by Laruicci, and Saint Laurent Leather Billy Platform Buckle Ankle Boots ($1,695.00). Little Mix released their new music video for Woman Like Me ft. Nicki Minaj yesterday. For the first shot Jade was wearing a Zara Basic Turtleneck Shirt ($19.90), House of CB Naked Bandage Briefs (£29.00), a Gucci Crystal Single Hair Clip ($400.00) and ASOS Design Elsa Sock Boots ($64.00). In the next shot she was wearing a Nicopanda Spring 2019 RTW Jumpsuit (Not available yet), Christianah Jones I’m Basically Your Lover Now Sunglasses (£69.00) and Nike Air Vapormax Plus Sneakers ($190.00). 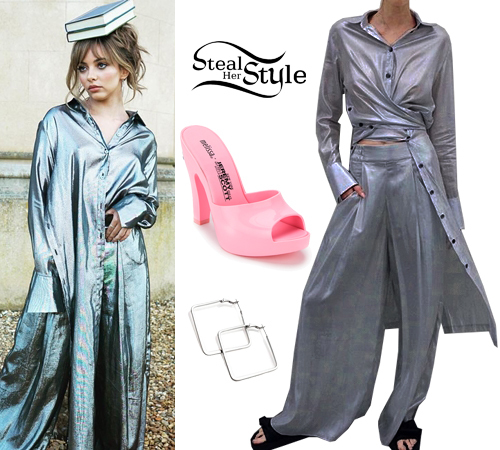 For this shot Jade is seen wearing a Metallic Evolution Shirt/Dress ($1,200.00 – wrong color) and Metallic Infinity Pants (Not available online) both by Lakris Brand, Missy Empire Annie Silver Square Hoop Earrings ($10.65) and Melissa + Jeremy Scott Mules ($86.18). 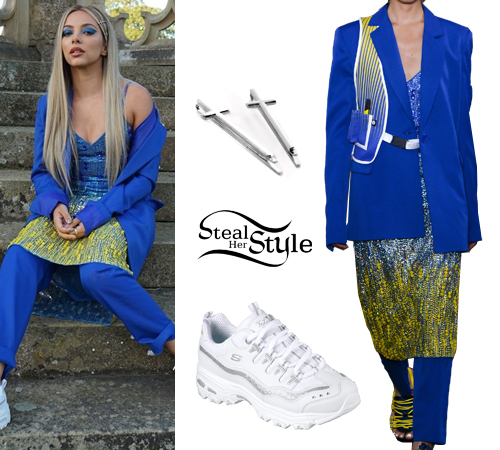 In another shot she wore a House of Holland Spring 2019 RTW (Not available online), Aaron Carlo Silver Cross Clips x2 (£12.00) and Skechers D’Lite Sneakers ($102.00). 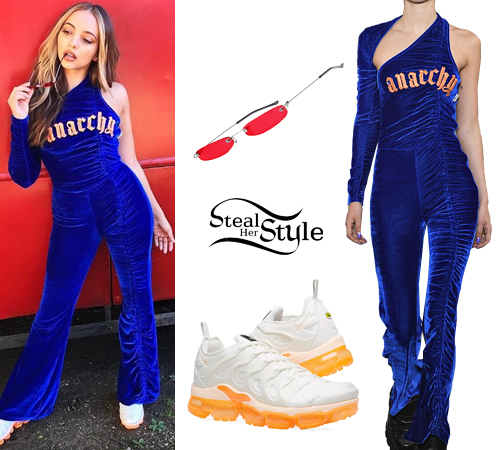 For this shot Jade is seen wearing a Tulle Square-Neck Top ($670.00), Lace-Up Satin Pants ($2,195.00) and Cinderella Crystal-Embellished PVC Pumps ($1,295.00) all by Dolce & Gabbana, Butler & Wilson Vintage Cross Chain Necklace (£61.20) and Dents Long Tulle Evening Gloves ($34.50). Little Mix released their new music video for Woman Like Me ft. Nicki Minaj yesterday. For the first shot Perrie was wearing a Zara Basic Turtleneck Shirt ($19.90), House of CB Naked Bandage Briefs (£29.00),a Yellow Gold Love Chain Bracelet ($1,630.00), a Yellow Gold Juste Un Clou Bracelet ($6,800.00) and Yellow Gold and Diamonds Juste un Clou Ring ($4,000.00) all by Cartier, with ASOS Design Elsa Sock Boots ($64.00). In the next shot she is seen wearing a cropped Zara Ribbed Turtleneck Sweater ($35.90), Pretty Little Thing Yellow Neon Crop Top (Sold Out), Seen Torn Flap Jeans ($1,136.00), Gogo Philip Eclipse Hoops (€49.00), a Yellow Gold Love Chain Bracelet ($1,630.00), a Yellow Gold Juste Un Clou Bracelet ($6,800.00) and Yellow Gold and Diamonds Juste un Clou Ring ($4,000.00) all by Cartier, and Balenciaga Triple S Sneakers ($890.00). For this shot Perrie is seen wearing an Off-White c/o Virgil Abloh Flared Long Dress ($1,575.00), a Yellow Gold Love Chain Bracelet ($1,630.00), a Yellow Gold Juste Un Clou Bracelet ($6,800.00) and Yellow Gold and Diamonds Juste un Clou Ring ($4,000.00) all by Cartier, with pumps like the Celine SS13 Mink Fur Shoes (Sold out). Here you can see Perrie in a Purple Tailored Suit Jacket ($706.00), Printed Logo Long-Sleeve Mesh Top ($154.00) and a Ruched Sheer Skirt (Not available online) all by House of Holland, and Skechers D’Lite Sneakers ($102.00). In another shot Perrie is seen wearing a Cold-Shoulder Lace-Up Stretch-Tulle Midi Dress ($3,495.00) and Crystal-Embellished Patent-Leather Mary Jane Pumps ($1,205.00) both by Dolce & Gabbana, with a custom-made Malan Breton Leather Hat. Emily Ratajkowski was spotted out in Milan during Fashion Week wearing a Knit Mock Neck Top ($29.90) and matching Knit Skirt with Vent ($49.90) by Zara, Montunas Lirio Flower Pot Mini Shoulder Bag ($435.00), Garrett Leight Del Rey Sunglasses ($340.00) and Jacquemus Rumba Sandals ($632.00). Emily Ratajkowski was spotted shopping at Dolce & Gabbana in New York wearing The Line by K Sisley Ribbed Jumpsuit (Sold Out), Reformation Nina Sunglasses ($98.00), Zara Vinyl Crossbody Bag With Clasp ($45.90) and AMI Running Lucky 9 Panelled Nubuck Trainers ($473.00). 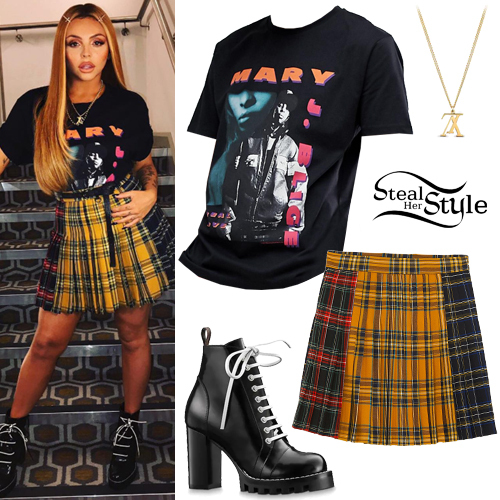 Jesy Nelson posted a picture on instagram wearing an ASOS Design Mary J Blinge Relaxed T-Shirt ($22.11), Zara Patchwork Mini Skirt ($69.90), the LV Upside Down Necklace ($330.00) and Star Trail Ankle Boots ($1,360.00) both by Louis Vuitton. Leigh-Anne Pinnock was spotted leaving Cantina Laredo in London wearing Off-White c/o Virgil Abloh Stripped Cotton Open-Back Shirt (Sold Out), Zara Jeans with Black Velvet Band ($69.90), a Moschino Parcel Clutch Bag (€161.89), a Cartier Juste Un Clou Yellow Gold Bracelet ($2,270.00) and Saint Laurent Jane Two-Tone Leather Sandals (Sold Out).